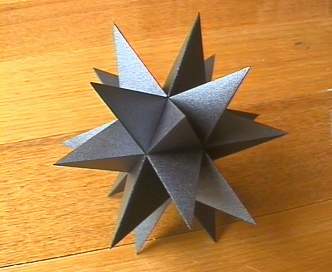 This model is a compound of the great stellated dodecahedron and its dual, the great icosahedron, both Kepler-Poinsot Solids. 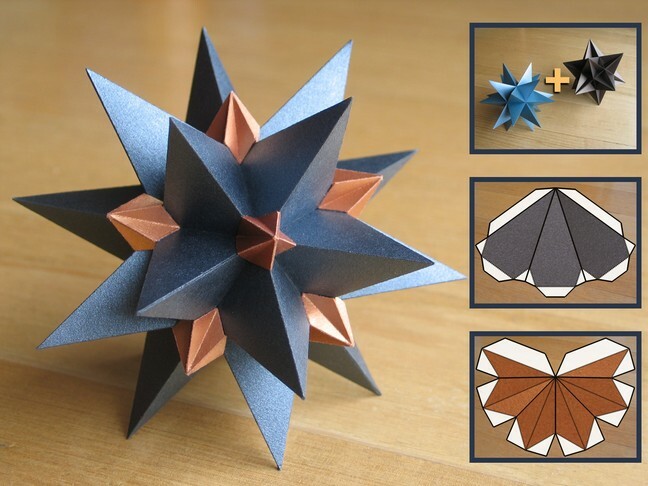 The model is also a stellation of the Great Icosidodecahedron. All compounds of regular polyhedra and their duals display pairs of edges which bisect each other at right angles. You can see places where some edges intersect others at right angles, but those are additional occurrences and not bisecting. The ones which bisect, and occur between dual edges, occur out of sight. Look half way along one of the long pentagram edges, or half way along one of the shorter triangle edges and you'll see where it's hiding, beneath the concave intersection of two pentagrams. If the great icosahedron where any larger, it would start to show at those points. This model has a diameter just under 12cm. First, construct the central great stellated dodecahedron. Then add the great icosahedral tips.